Empoli languish in 17th place on the table, they haven’t looked the same since Sarri left them to coach Napoli a year and a half ago. This season, Saponara has only one goal and one assist in twelve starts for Empoli this year. 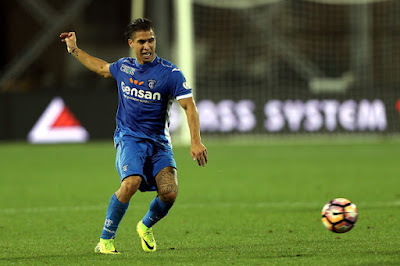 Another potential Milan ex- regret is José Mauri, who has yet to find a goal or assist in six starts and one substitution for Empoli. But hey, that’s like seven more appearances than he made at Milan. I suppose you could regret Gilardino, but like an ex- who has slept with pretty much everyone you know, there are really no regrets for a player who has played for practically every team in the league. If you’re really looking hard for some Milan regrets, look at Big Mac, captain Massimo Maccarone, who grew up in Milan’s youth system but was subsequently loaned out and then sold. 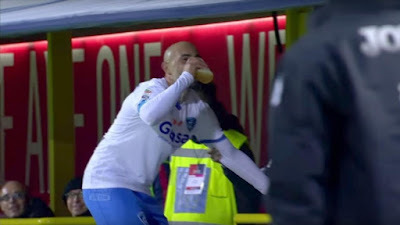 Personally, he will always be my hero for his celebration vs. Bologna last year after his first goal, where he grabbed a fan’s beer and chugged. Then went on to score the game winner. But hey, no regrets, right? Was this possibly the best goal celebration ever? Martusciello has got to find some confidence under a rock or something after Fiorentina thrashed Empoli last week 4-0. Even if Empoli had done the same to Pescara before the international break. For the matchup against Fiorentina, Martusciello lined up Skorupski; Costa, Bellusci, Pasqual, Veseli, Pussiarelli, Diousse, Saponara, Croce, Krunic, and Maccarone. He will be missing Zambelli, Mchedidze, and Laurini to injury. 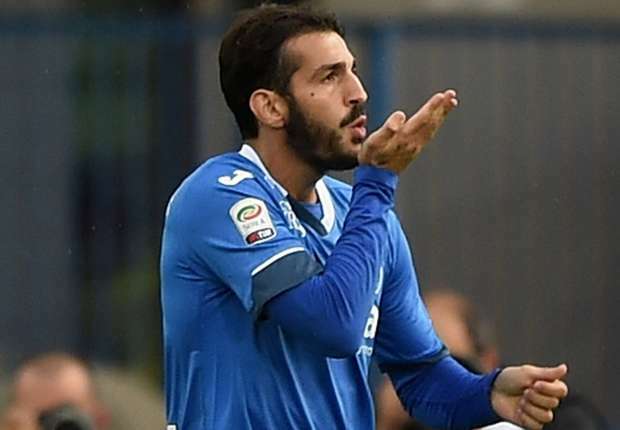 Playing at home with a nearly full-strength squad and playing for survival means that Empoli have nothing to lose, and could hand us a surprise defeat if we are not vigilant. Montella has more than just vigilance to be concerned with. Despite the Derby draw, which deflated the squad faster than a needle to a balloon, he’s got some injury concerns. The most recent is Bacca, who was injured in that fateful game, and will definitely miss Saturday’s match. Montolivo is still out, as are Calabria and Bertolacci. I think Vangioni may just be perpetually injured by his agent’s comments, but he’ll miss again as well. And then there is Romagnoli, who is fighting to make it back in the squad on time. Hopefully he is 100% before he is risked again, we need him in some big games coming up. This will be an important test of Montella’s work with mentality. With so many people acting like the draw was a defeat, he’s really got to rally the troops and ideally take all three points before Milan face Crotone, then Roma and the surprise stars Atalanta ahead of our trip to Doha for the Supercoppa match vs. Juventus. Although we may feel some pulls on our Milan heart strings, we have to look forward, not back and focus on these three points. The players we loved may be gone and be wearing the opposition jersey now, but we have to dig deep in our red and black blood and cheer our current team to victory. Both for our position now and our success for the rest of the season, we need to win every single three point opportunity we can, and this is no time to think of what might have been. So Forza Milan and no regrets. This match will shown LIVE on RAI and BeIN Sports in the U.S.